Is the Jamaica Inn in Cornwall haunted? 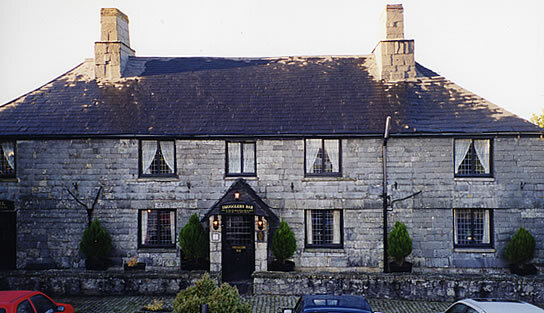 Built in 1750, the Jamaica Inn was a coaching inn. Travelers using the turnpike between Launceston and Bodmin would stay at the Inn after having crossed the wild and treacherous moor. Some of the travelers were a little less respectable than most and used the Inn to hide away the contraband that had been smuggled ashore. It is estimated that half of the brandy and a quarter of all tea being smuggled into the UK was landed along the Cornish and Devon coasts. Jamaica Inn was remote and isolated so it was the ideal stopping place on the way to Devon and onward. It is also thought that the Inn may have got its name because it did a considerable trade in rum! Many years ago, a stranger stood at the bar enjoying a tankard of ale. Upon being summoned outside, he left the half finished ale and stepped out into the night. That was the last time he was seen alive. The next morning his corpse was found on the bleak moor but the manner of his death and the identity of his assailant still remain a mystery. Who is the stranger sitting motionless on the wall outside? In 1911 there was much interest and correspondence in the press concerning a strange man who had been seen by many people, sitting on the wall outside the Inn. He neither spoke nor moved nor acknowledged a greeting but his appearance was uncannily like the murdered stranger. Could this be the dead man's ghost? And what strange compulsion drove it to return to the same spot so often? During the early 1900s the Inn was used as a temperance house but there have always been spirits of a different kind at Jamaica Inn. On a moonlit night, when all is still, how can any earthly person explain the sound of horses' hooves and the metal rims of wheels turning on the rough cobbles of the courtyard? Yet there is nothing to be seen!Who can explain the uneasy footsteps heard pacing the corridors in the dead of night? Who is the strange man in a tricorne hat and cloak who appears and then walks through solid doors?